Two technology companies recently partnered to deliver innovative business solutions for the country’s expanding small-and-medium enterprises (SME) market. 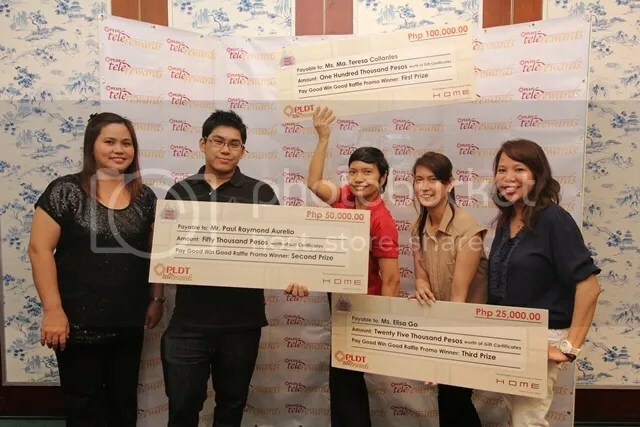 And for the winners of PLDT HOME’s Telerewards ‘Pay Good Win Good’ promo, last February 14 proved to be a thunderstorm when 300 subscribers won gift certificates worth P2,000 from Jollibee, while three grand winners snared GCs in P25,000, P50,000 and P100,000 denominations. 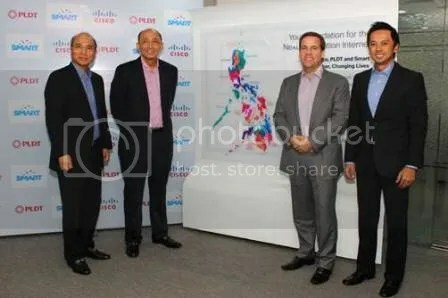 (L-R): Orlando B. Vea, Smart Chief Wireless Advisor; Napoleon L. Nazareno, President and CEO, PLDT/Smart; Les Williamson, Vice President for Asia and ANZ at Cisco; Stephen Thomas Misa, Cisco’s Country General Manager for Philippines. Philippine Long Distance Telephone Co. (PLDT) and Smart Communications Inc. (Smart), the country’s largest telecommunications providers, and Cisco have partnered to expand the PLDT Group’s nationwide broadband network to meet growing local demand for high bandwidth fixed and mobile services like 3G, HSPA+ and LTE. This collaboration, which has resulted in the installation of more than 40 core sites wired nationwide, is part of PLDT’s Network Modernization Program to bring Internet Protocol Next-Generation Network (IP NGN) to the Philippines. PLDT cares for its legion of customers that is why the company is inviting all PLDT subscribers to register to its Telerewards program and enjoy various benefits and exciting opportunities to make their dreams a reality. Customers have until the end of September to register. With the holiday season around the corner, who wouldn’t want to have a shopping spree in an SM Supermarket to get your favourite items and goodies to prepare for the merry month? Well, this is one of the main and truly exciting benefits when PLDT subscribers become a registered member of Telerewards. Rising mobile data usage will power continued growth for leading wireless operator Smart Communications even as the cellular penetration rate approaches 100 percent in the second half of 2012. But this surge will come in the form of many “tiny bites of the Internet,” top Smart officials say. In the first quarter of this year, mobile Internet usage of Smart subscribers surged by 71 percent versus a year ago. Mobile phone leader Smart Communications recently announced that it has completed the installation and optimization of new base station equipment for its entire cellular network all over the country. Starting in late 2011, Smart replaced the radio equipment in 9,500 base stations with next-generation facilities that have increased its network’s capacity to handle voice, text messaging, and mobile broadband services. 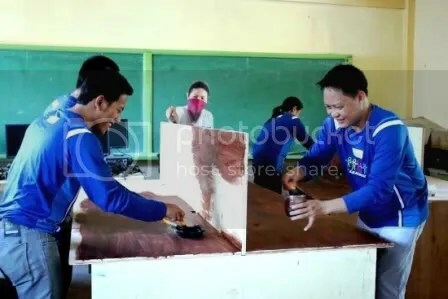 Smart employees varnish the tables for Balulang National High School’s computer laboratory in time for the turnover of the brand-new personal computers from PLDT-Smart Foundation. Telco giants PLDT and Smart Communications are coordinating efforts to help rehabilitate a school in Cagayan de Oro damaged by Tropical Storm Sendong last year. Balulang National High School was severely affected by Sendong, losing its entire computer laboratory, including some 20 personal computers.